Hockey Plumber News reporter Brian Fantana has learned that there will be no decision made tonight. Leading him to ask the question, "when does Jagr Watch turn into Jagrgate?" 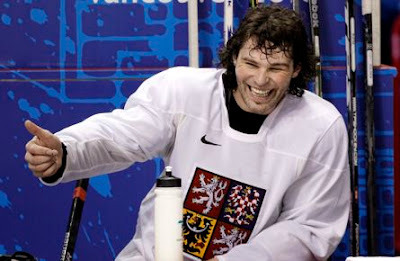 Jaromir Jagr joining the Penguins is on hold. So it appears the Fantana, as well as the local sports media in Pittsburgh have another restless night on their hands. In related news Pittsburgh did come to terms with Aaron Asham per @TSNBobMcKenzie. One year deal worth $775k.